Comes with a 3.2 gallon pressure tank. 5 micron Particulate Filter to Remove Particles: Removes dirt, sediment, sand and other physical particles. Activated Carbon: Reduces chemicals, such as chlorine, that may be in your water supply. 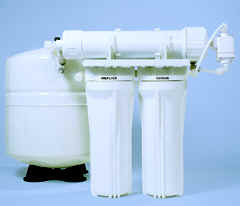 Reverse Osmosis Membrane:Reduces 93%-98% of dissolved mineral salts and other contaminates in your potable water supply. Post Carbon Filter: A polishing process that removes tastes and odors out of the water.